Assessing and reporting on the transition to a low carbon economy is a key area of interest for public- and private-sector banks. In the months preceding the United Nations climate change conference in Paris in 2015, many of the world’s leading banks made commitments to either decrease the financing of “climate problems” or increase the funding of “climate solutions”. However, only accurate and standardised metrics will allow progress on these commitments to be measured and monitored. 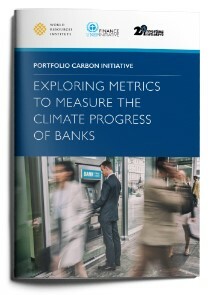 This paper assesses the various metrics that can be used to assess a bank’s contribution to the climate solution or problem and makes recommendations for choosing climate metrics by asset class. The report also addresses the potentially conflicting aims of transition financial risk (a business risk) and climate policy goals (a societal risk). This publication is one of a series of outputs by the Portfolio Carbon Initiative (PCI), a collaboration of 2 Degrees Investing Initiative (2dii), the World Resources Institute (WRI) and the United Nations Environment Programme Finance Initiative (UNEP FI). It follows a 2015 sister publication for investors, Climate Strategies and Metrics: Exploring Options for Institutional Investors. To find out more, read this blog explaining more about the development of climate metrics for banks.